The Texas Tribune is the only member-supported, digital-first, nonpartisan media organization that informs Texans — and engages with them — about public policy, politics, government and statewide issues. Each year, the Texas Tribune hosts 50-plus on-the-record, open-to-the-public live events — on college campuses, in community centers and everywhere in between — at which public officials, policy wonks and newsmakers answer for the work they’re doing and how they’re spending tax dollars. Events are often available via livestream video, for those who can’t attend in person, and following the conversation Texas Tribune publishes and archives video online. The 2018 Texas Tribune Festival will be held September 27-29 in Austin, Texas, USA! This annual event offers three days of unique perspectives, thoughtful conversation and networking all downtown in Texas’s capitol. There will be a star-studded lineup of more than 300 leading international, national and state figures in politics, public policy and journalism; these marquee figures will be joined by thousands to discuss big-picture solutions to the most pressing policy issues. The overall goal is to come away more engaged and civilly conscious than before! This year’s TribFest will also include the third TribFeast, a gala dinner to support nonprofit journalism. This year they will welcome the cast of the Showtime series “The Circus”: John Heilemann, Alex Wagner and Mark McKinnon. 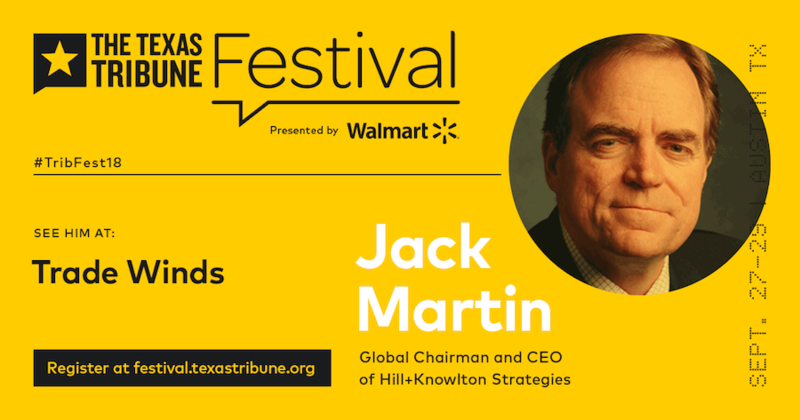 Our very own Jack Martin, Global Chairman and CEO of Hill+Knowlton Strategies, will be joining Dallas State Representative Rafael Anchia and former U.S. Trade Representative Ron Kirk for a discussion on NAFTA and its effects on economic future of Texas. Trade Winds will take place on Saturday, September 29 at 12:45PM EST. The panel will be moderated by Julián Aguilar, Immigration and Border Security Reporter for the Texas Tribune. This event will be live-streamed. Watch here or on H+K Facebook.